The 10th annual Civil Service People Survey goes live today, Monday 1 October, and runs until Wednesday 31 October. The survey is your opportunity to make your views known, in complete confidence, on what it’s like to work in the Civil Service and in your own department. Our goal is to be a brilliant Civil Service. Every survey gives us valuable information that helps us make decisions about how to make the experience of working here better for everyone. Every improvement brings us closer to our goal of consistently world-class support for the Government and the best possible public services for citizens. 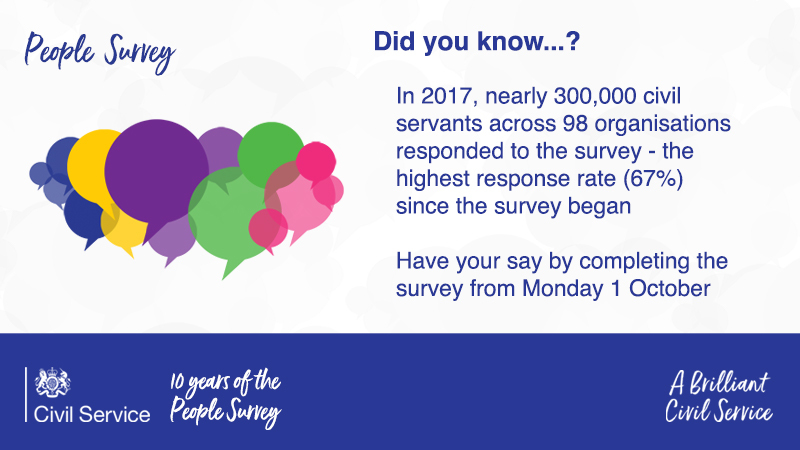 Please note: The People Survey runs across more than 100 organisations, on a department-by-department basis, and the results are then aggregated for a CS-wide result. This explains why there is no central link to access the survey. You will find details on how to take part on your local intranet, or you can ask your manager. Last year, the average survey response rate for the Civil Service as a whole was 67%, the highest it’s ever been. The majority of 2017 benchmark scores showed improvement over the previous year, and the overall Employee Engagement Index (based on five questions that give an indication of how people feel about working in their organisation as part of the Civil Service) reached a record 61%. Scores for eight of the nine themes in the survey also rose, to their highest level since the survey began in 2009. This, at a time when the Civil Service is facing some of the biggest challenges in its history. While there was some encouragement in higher scores for questions around ‘Inclusion and fair treatment’, the benchmark scores for bullying, harassment or discrimination did not move. We need to take this extremely seriously, because we know that a contented workforce in a fully supportive environment is a more productive one. We acted swiftly on what you were telling us and commissioned a review of our cross-Civil Service arrangements for tackling bullying, harassment and misconduct. The report into this review is available now for you to read on GOV UK. We have to keep the momentum up if we are going to realise our ambition for the Civil Service to be the UK’s most inclusive employer by 2020 and a great place to work for everyone. We have to do more to make sure that civil servants everywhere, regardless of background and personal characteristics, feel comfortable to be themselves and have an equal chance of reaching their potential. 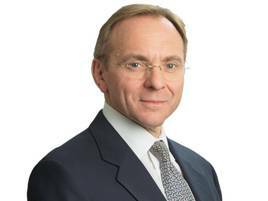 The Civil Service is in the middle of a major transformation in the way we work and how we are structured, all geared to helping us meet the challenges we face. A key part of this is creating new and sustainable career pathways for our people. These will be built around a set of functions and professions that cut across government, giving greater flexibility and opportunities to accumulate professional experience. Although the benchmark scores for questions on the theme of Learning and Development questions all rose last year, we need to boost them further. We know that the Competency Framework for recruitment and promotion doesn’t have the full confidence of civil servants. So we are launching a new approach in 'Success Profiles'. In effect, this approach says that, while competencies matter, so do track record, technical ability, behaviours and values. And it relates to acquiring experience, and offering careers that build both depth and breadth of experience. I believe this is a significant change. It means we can encourage people to build - and be promoted within - a career path, while accumulating skills and deeper experience in their chosen profession. But it’s you who are the final arbiters of how successful we are in taking steps to prepare the Civil Service to meet the challenges of the future; and it’s your views that will show how much more we need to do and where. So, please, do take part in the People Survey and help us to make your views really count. The Civil Service has not acted swiftly on bullying and harassment as the report has only just been published last week and provides a limited picture on actual action being taken, so any improvement unlikely to be seen. "Every survey gives us valuable information that helps us make decisions about how to make the experience of working here better for everyone." Could you please cite an example. Here at the MOD we are facing huge cuts to the workforce, frozen pay,terms and conditions slashed on top of the bullying culture that exists in military circles so I don't feel that the survey reflects our day to day working environment in anyway.Also total lack of any form of respect from politicians is also a huge cause of resentment among my fellow Civil Servants. Where is the survey then? How can we access it? I don't have any faith in these surveys. I've twice (several years apart) heard directly from superiors that answers saying we don't think much of our managers is because we have as a team misunderstood the question. One even suggested that the next year that we should have the questions explained to us. If an attitude exists whereby unfavourable replies are dismissed as the fault of the respondents, rather than investigating the causes and potential improvements that could be made then is there any point. Is there a link to take the survey? Why is there no link from this article to the 10th annual Civil Service People Survey? Despite reports/plans being published nothing has been done in the office I work in, if anything there has been a very clear disregard of the staff survey findings. Is it me? I can't find the link to the survey! Success Profiles are still very heavily based upon competencies. They do not consider mandatorily academic and vocational qualifications that prove someone has potential. Therefore, as a result, job vacancies are biased to Civil servants who are fortunate enough to have already had the chance to obtain relevant experience or to private sector applicants who have the same. The issue of a Civil servant who has potential, but has little or no opportunity to display this, does not get a chance to be successful in any job application. That is, of course, they have teh skill (or are shown) how to write a 'good' competency (although, once again, the problem of this also includes subjectivity of the assessor). A real Success Profile would include a consideration of academic and vocational qualifications and their relevance to a role, job / role history and, perhaps, some competency inclusion on top of this. Perhaps a system of scoring for qualifications and experiemce woudl also make the system fairer? Up to now, unfirtunately, I do not think much has changed for the better. Agreed, I have just been on the training and while the scope to measure people on strengths and technical abilities is in there, there is no guidance on the weighting of these so I suspect that as most people resist change we will still see a heavy reliance on the "behaviours" which are competencies under another name, except perhaps in highly technical roles. Having worked incredibly hard at school and university and demonstrated a great deal of potential, it rankles somewhat that this is not valued at all in the civil service. Opportunities to shine on competency based examples are very much bounded by being in the right team at the right time, and the system is of no use whatsoever if you want to take a different career direction (perhaps indulging your natural potential) than the team you happen to have been shunted into. I agree with your assessment of being in the right place at teh right time. However, this also leads to some applicants who have come inti teh Civil Service as EO/ HEO/ SEO based uponwhat tehy state that they have achieved. How verifiable is this? Also, so much for loyalty...I had to get promoted twice to become an EO. I then diid more qualifications through the Department and even these are not considered in Competency based applications. Incredibly frustrating. What about those ex civil servants that you contractorised that still remain loyal and in their jobs after 40 years service ? Thanks to everyone commenting on this blog post. A number of you are asking where you can find a link to access the survey. As noted in the post, there is no central link, because the People Survey is conducted across more than 100 organisations, on a department-by-department basis, and the results then aggregated for a CS-wide result. You will find details on how to take part on your local intranet, or you can ask your manager. Ok - but the link I clicked in my e-mail said 'take the people survey' not 'click here for a description of the survey and then find your own way to it'! Perhaps the link should have been titled 'find out more about the People Survey'. Perhaps it's not a big point but as good Civil Servants, we should aim to not deliberately mislead people! I'm not convinced that these surveys are being used to improve the performance of organisations that consistently return poor results. Is anyone in these organisations truly being held to account? Of course, without accountability, complacency soon sets in and the whole thing becomes another box-ticking exercise. "'Success Profiles'. In effect, this approach says that, while competencies matter, so do track record, technical ability, behaviours and values. "...but what about formal training and QUALIFICATIONS?! As I've said at CS Live events and Building our Future in HMRC, if the CS of a nation does not respect the formal training and qualifications of its universities and colleges, why bother having these institutions? Coming in from a manufacturing background, I naively thought the CS would probably have more not less respect than the private sector for this aspect of our CVs. In my opinion, formal qualifications should nearly always be among the material that sifters go by. I shall use myself as an example: I have been stuck at AO grade within HMRC for several years, sometimes getting past a psychometric test but failing to reach the interview due to relatively weak competencies - but if sifters knew I had a BA in Humanities and the (Australian) equivalent of a HNC in Management, I may well have got to some interviews and may not be, probably, one of the most under-employed folks in the CS. hear hear, stuck at EO for 15 years here despite having an impeccable academic record to postgraduate level; my competencies are apparently good enough to get through the HEO sift half the time but anxiety in an interview situation means I am not able to put them across well and my job experience means that some of them are getting old and stale. I cannot understand why only 67% of the Civil Service can spare the 20+ minutes that it takes to complete and provide the Leadership with the feedback on where improvements are needed. It really is not that difficult to complete and I have seen some changes resulting from the previous staff surveys. It's because these surveys are often spun to show the current leadership in a good light. Bad results are not acted on and are even patronised by those at the top. The people survey is for one reason and one reason only.....for management to tick their box and say they have "engaged" with staff.....the results are irrelevant....the staff are ignored. I have been a Civil Servant for 22 Years and for most of that time I have been happy in my job and with the company. Unfortunately for the last few years this loyalty has dwindled dramatically. I am an E1 who has reached the ceiling for pay on that grade, and for that reason only I have been discriminated against when it came to an annual pay rise. In fact I decided to check my payslips from August 2013 to August 2018 and over these 5 years my pay has increased by £26 after tax!!!!!!!!. Maybe you still believe that the terms and conditions we work under are still the best but you would be wrong!! Most big companies give you the same terms and conditions and in some cases better them. Hi Sandra I understand your frustration .16 yrs with the Civil Service and I'm still £1000 off the top of my pay grade at AO level . How does that work ? At the rate we are going I will retire before I get there in 8 years time . I am sorry to say this but 67% is nothing to be proud of. We should be at 80% at least, surely?! I would be more than happy to help the cause. Again, like previous responders, I am struggling to find the link to do the survey. Please put something in place so that people can access it directly/quickly so that "access frustrations" do not deter people from taking the survey. The saddest part of this is the Mr Manzoni clearly genuinely believes that things are improving for everybody in the CS. Spend an hour or two with anybody at the coalface of any Dept and the picture may be ever so slightly different. Until the Civil Service, as a whole, and individual departments start to act on peoples concerns re pay this survey is invalid. Pay continually scores badly but is never mentioned as an area for improvement or a factor that needs addressing. Within my department we are just fed the line that "it's very difficult" - Well, we all have difficult aspects to our jobs but we are expected to overcome them why does this not apply to those responsible to achieving better pay? Except that is not on their agenda to make things better, the survey is just a box ticking exercise to make it appear they are engaging with staff. The not so hidden agenda is to make things worse. I have recently completed the Bullying, Harassment, Discrimination and Misconduct survey and followed the blogs with great interest. I look forward to the changes that the review will bring. Like many people, I would like to see those in management positions better trained, especially in soft skills, AND an independent body outside the Civil Service to deal with formal complaints. I have to agree with Ratface. The Civil Service has changed so much for the worse over the years. Getting a job in a good team is becoming increasingly rare. Like winning the lottery! The annual Civil Service survey carried out by individual departments does no longer appeal to me since I have not witnessed any improvements as the result of them. It makes me wonder what the real purpose of these staff surveys is. maybe I am being stupid, I can see how many people responded but not sure what percentage is attributed to each of the response options. Can anyone tell me where to find that? I wouldn't want to assume the percentage relates to agreement or contentment with what was being asked.